Sandra Bullock, George Clooney, Ed Harris. 91 minutes. It has been seven long years since Alfonso Cuaron’s last film, the dystopian science fiction masterpiece CHILDREN OF MEN (2006). In the intervening years he’s seen potential projects come and go, and experienced turmoil in his personal life, but throughout it all was the idea for a film that would explore his fascination with outer space. He saw Stanley Kubrick’s 2001: A SPACE ODYSSEY (1968) at an impressionable age and became interested in space exploration. With his son, Jonas, Cuaron wrote the screenplay for GRAVITY, figuring that he could crank it out in a year’s time. At one point, he even lined up Angelina Jolie and Robert Downey Jr. as the leads, but when he realized that the technology to realistically depict a zero gravity environment wasn’t available, he spent years waiting and lost his two actors. Fortunately, when the time was right, he got George Clooney and Sandra Bullock. Advanced word was very strong, with festival reviews raving about how Cuaron had realistically captured the physics of outer space and created an immersive experience by filming it in 3D. Such reviews marked GRAVITY as a must-see event. For all of its astounding technical merits, does the film tell an engrossing story with compelling characters? Mission Commander Matt Kowalski (George Clooney) and Dr. Ryan Stone (Sandra Bullock) are working on the Hubble Space Telescope high above the Earth. Cuaron introduces them in an impressive long take that immediately immerses us in outer space life in a way that no other film has done before. It’s Kowalski’s last expedition and Stone’s first one, and so the former calms the latter’s beginner’s nerves. The vista shots of Earth are truly breathtaking and really give a sense of scale that is a wonder to behold. During the repair job, Kowalski and Stone are informed by Mission Control that debris from a Russian anti-satellite test is going to be heading their way in a matter of moments and that they must abort their mission. Cuaron’s camera zooms around the shuttle as the debris wreaks havoc, sending Stone spiraling off into space. As this happen, Cuaron seamlessly shifts to her point-of-view for maximum visceral effect as we feel and get a sense of just how alone and freaked out she is, cut off from Mission Control and Kowalski. It seems like an utterly hopeless situation as she drifts helplessly in space. Stone has to somehow find Kowalski and get back to their space shuttle in what is an incredibly tense and exciting journey. It was a masterstroke for Cuaron to cast George Clooney and Sandra Bullock as the leads in his film because you need two actors that audiences find instantly likable and relatable, which makes up for the lack of characterization. Cuaron throws a few bits in, here and there - Stone had a child that died and her dad wanted a boy and not a girl, but other than that Clooney and, especially Bullock, who has to carry most of the film, have to use their innate charisma to get us to care about these characters, which they achieve. As good as Jolie and Downey are as actors, I don’t think they would have been able to gain our empathy as quickly and convincingly as Clooney and Bullock do. Bullock is quite good as an inexperienced astronaut trying to keep it together in the face of an utterly hopeless situation. You really feel for her as Stone tries to survive. The actress is called upon to convey a range of emotions and pulls it off. We are right there with Stone, hoping she’ll survive and Bullock uses every ounce of charm at her disposal to illicit our sympathy. GRAVITY would not work without her strong performance anchoring everything. I’ve never been entirely convinced by Bullock’s dramatic chops and always felt that her Academy Award she won for THE BLIND SIDE (2009) was more of a populist vote than for the actual performance, but without her, GRAVITY would just be nothing more than a really expensive and impressive-looking visual effects reel. George Clooney is excellent as the veteran Mission Commander who acts as the voice of reason, keeping Stone talking and distracting her from their situation. With his distinctive voice that exudes confidence, you feel like there is hope. Kowalski reassuringly talks her through things and keeps her focused and calm. Cuaron expertly creates a white knuckle ride by making Stone’s journey a difficult one fraught with one danger after another as she comes precariously close to dying on several occasions, including one insanely hair-raising sequence at the nearby International Space Station that is as intense as anything I’ve seen in a film for years. It makes the prospect of a shower of orbiting debris a terrifying experience. His fidelity to the physics of outer space is astounding and you really get a sense of what it must be like to exist out there. I like that he doesn’t resort to the Hollywood cliché of sound in space. Cuaron fills this void either through the film’s dramatic score or, more often than not, long intervals of being subjected to nothing more than Stone’s panicky, belabored breathing, which only adds to the intensity of the situation. You really get a sense that these characters are in very real danger in a startlingly tangible way. When he was child growing up in Mexico City, Alfonso Cuaron watched the Apollo Moon landings on television and dreamt of becoming either an astronaut or a filmmaker. However, the notion of joining the army in order to do the former didn’t appeal to him and so he pursued the latter. In the meantime, Cuaron made CHILDREN OF MEN, which came and went quickly from theaters, much to his dismay. Then, his marriage fell apart and his wife left, taking their two children to Italy. One of them became ill and Cuaron faced considerable expenses. So, he tried to mount a small foreign language film written with Jonas, but then the economy collapsed and the financiers pulled out. Cuaron felt that his only option was to make another film and it was long-time cinematographer and close friend Emmanuel Lubezki who told him, "Let’s do something big! Let’s do a studio movie!'' In 2009, Cuaron and his son figured that if they could hook an A-list actress, a Hollywood studio would be willing to bankroll their adventure film. Sure enough, the studios were interested, as was Angelina Jolie. Robert Downey Jr. was attached to the project shortly afterwards. Cuaron and Jonas always conceived of GRAVITY as a 3D film and even called the script, 'Gravity: A Space Adventure in 3-D'. He wanted to utilize long takes and few edits, which meant that every shot had to be meticulously planned out. Digitally animated storyboards were created that resembled, ''a crude Pixar film'', according to Lubezki. To simulate a zero gravity environment, the filmmakers initially considered wires and harnesses, but one could still sense the presence of gravity. Next up was the infamous ''vomit comet'', an airplane that could induce moments of weightlessness, which Ron Howard used in APOLLO 13 (1995). However, it didn’t satisfy Cuaron’s needs: ''You’ve got a window of 20 seconds if you’re lucky, and you’re limited by the space of a 727.'' They also tried motion capture, creating CGI actors, but it didn’t look realistic enough. Cuaron approached NASA early on, but they refused to support the project because it depicted a disaster and death in outer space. He sought out other experts and advisors who offered input that changed or cut scenes containing factual errors, but even the authentic technical jargon was toned down because ''it was absolutely distracting'', Cuaron said, and did not help ''the development of our characters.'' He then consulted both James Cameron and David Fincher who told him to wait for the technology. Cuaron realized that he would have to invent the technology in order to depict astronauts flying through space, creating the illusion of moving through a 3D environment. To do this, he decided that the actor wouldn’t move, rather the camera and lights would. The production created giant screens that would simulate atmospheric lighting conditions. This task fell to visual effects artist Tim Webber who’d studied physics at Oxford. He realized that this couldn’t be done through conventional means and would require a lot of computer animation, but going beyond what had been done in AVATAR (2009) because GRAVITY wasn’t a fantasy film, but a realistic-looking science fiction film. Principal photography began with filming the actors’ faces and then creating the world around them. Webber and his team had designed a nine-foot cube in which the inside walls were outfitted with 1.8 million individually controllable LED bulbs. Inside the cube, the film’s complex lighting changed all the time, from day to night. There was a special camera that moved with motion control, making moves to create the illusion that the actors were moving. Bullock spent most the shoot in it, strapped to a rig, which was nicknamed, ''Sandy’s Box'', on a soundstage in London that she described as ''lonely'' and ''isolating''. For actors used to the option of improvising, this method of filmmaking, where every shot and camera movement was pre-programmed and so they had to say and do everything exactly as written, was a very trying experience. It didn’t take long for a backlash to surface in the form of criticism that GRAVITY wasn’t as realistic as the filmmakers claimed. All I can say is that this is a fictional film not a documentary. To the layman it seems very realistic. The important thing is that as you are watching the film you believe in and are immersed in the environment created by the filmmakers, which it does very successfully. While the depiction of outer space opts for the realism of 2001, GRAVITY eschews the philosophical, metaphysical musings of Kubrick’s film for more of a kinetic thrill ride as Cuaron piles on one life-threatening danger after another on poor Stone. Much like AVATAR, GRAVITY is a film that needs to be seen in 3D on the big screen in order to fully appreciate the immersive experience Cuaron has created. This is easily the best film shot in 3D since Cameron’s film. I would also go so far as to say that Cuaron has made the best realistic outer space film since APOLLO 13. Abrams, Bryan. “One of the Greatest Cinematographers Ever: Gravity’s Emmanuel Lubezki.” The Credits. October 3, 2013. 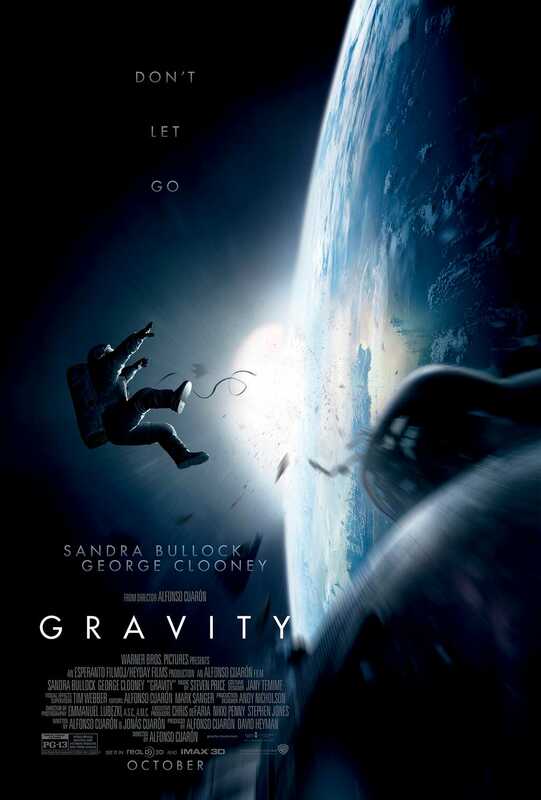 Lee, Dan P. “The Camera’s Cusp: Alfonso Cuaron Takes Filmmaking to A New Extreme with Gravity.” New York magazine. September 22, 2013. Lee, Dan P. “Alfonso Cuaron Answers All Your Questions About Gravity.” New York magazine. October 7, 2013. Woerner, Meredith. “You Can’t Watch Gravity Like a Typical Movie, Warns Alfonso Cuaron.” Io9. October 2, 2013. J.D. Lafrance is a freelance writer born and raised in Canada. He likes reading anything written by Jack Kerouac, James Ellroy, J.D. Salinger, Harlan Ellison or Thomas Pynchon and counts David Lynch, Michael Mann and Terrence Malick among his favorite filmmakers. He writes in-depth film articles for his own blog Radiator Heaven, and is currently researching a book on the films of Michael Mann.